Homicide detective Alexandra Jarvis answers to no one. Especially not to the new partner assigned to her in the middle of a gruesome serial killer case—a partner who is obstructive, irritatingly magnetic, and arrogant as hell. Aramael is a Power—a hunter of the Fallen Angels. A millennium ago, he sentenced his own brother to eternal exile for crimes against humanity. Now his brother is back and wreaking murderous havoc in the mortal realm. To find him, Aramael must play second to a human police officer who wants nothing to do with him and whose very bloodline threatens both his mission and his soul. Linda Poitevin was scheduled to stop by for an interview this week, but unfortunately due to some Internet glitches that wasn't possible. But please stay tuned as the interview will still be taking place! 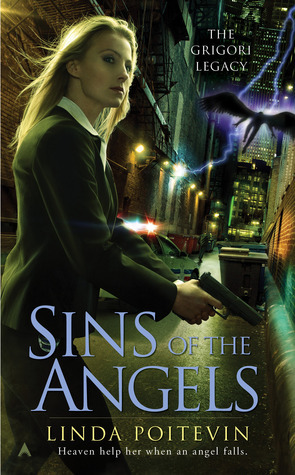 In the meantime grab yourself a copy of Sins of the Angels for a thrilling read! Have any questions for Linda or her book? She'll be stopping by throughout the day to answer any readers comments! Hopefully the goblins/glitches will be worked out. Halloween Countdown: Top 5 Ghost movies! Halloween Countdown: Warm Bodies Giveaway! Autumn: Purification by David Moody + A Giveaway!